You are currently browsing the tag archive for the ‘Maltese Falcon’ tag. Here are my posts from June 2 and 3 last year. 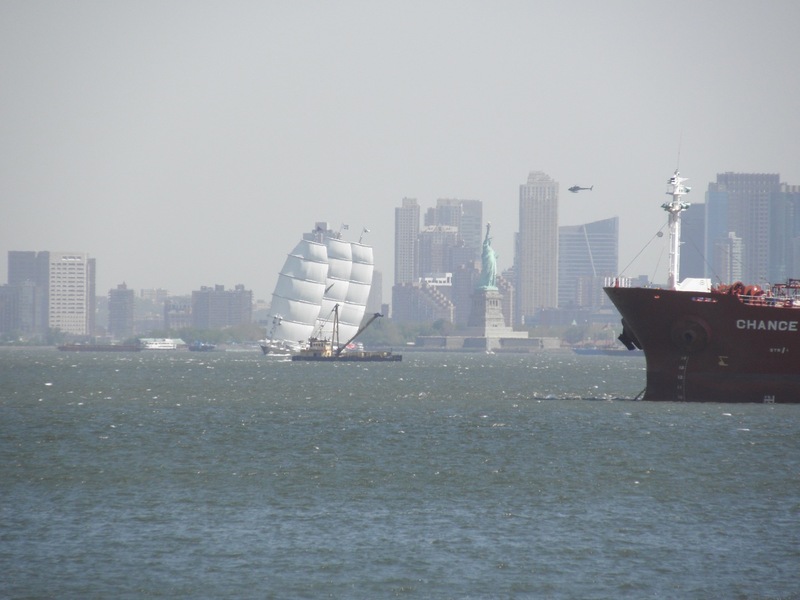 It was the day Maltese Falcon stooped across the bay with all sail set, sending the orange boat in the foreground to flee in panic, as if prey. she douses her sails, at the push of a button and cruises past a Blue Marlin in Day 12 of a prolonger loading. It took ten more days to have the load secure for departure. A day-by-day report of that loading process is in the “Tale of Two Marlins” link to the left. 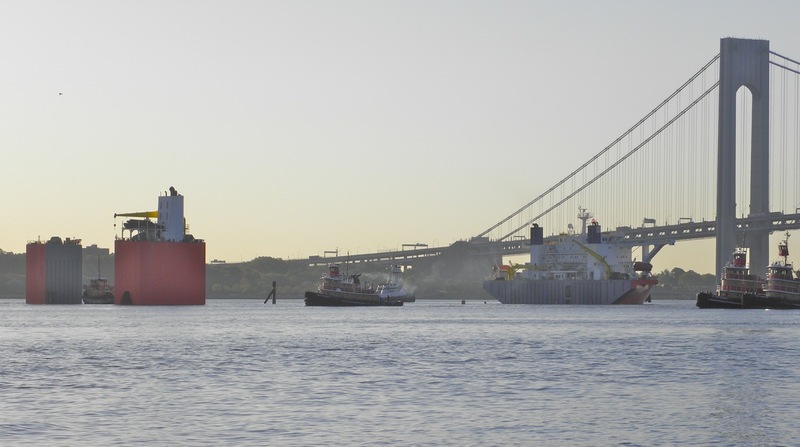 Since that trip last June, two more Dockwise vessels have taken US equipment over to West Africa. Today, Blue Marlin is anchored off Malta, Maltese Falcon at the dock in Genoa, the former Reinauer tugs work off Nigeria. So far I’ve gotten no response to requests for fotos from Nigeria. 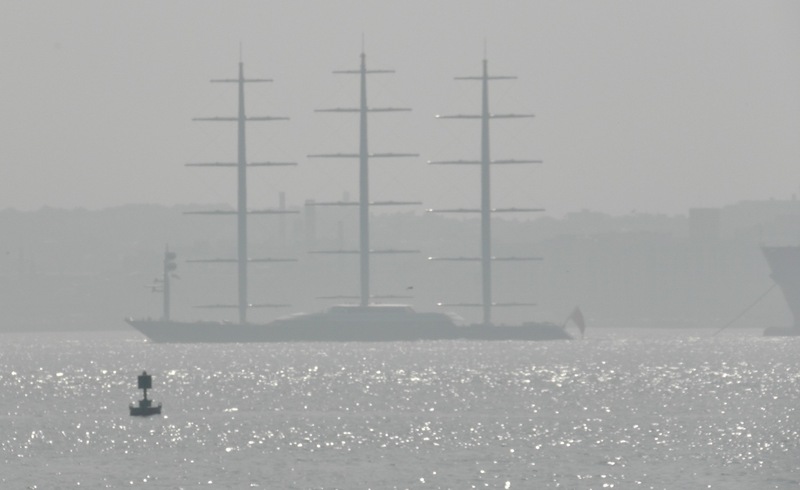 Looking northward from Staten Island, here was my first view of Maltese Falcon under sail yesterday; it looked as if someone had photoshopped Cutty Sark heeled over into a routine sixth boro scene, complete with a Staten Island ferry. 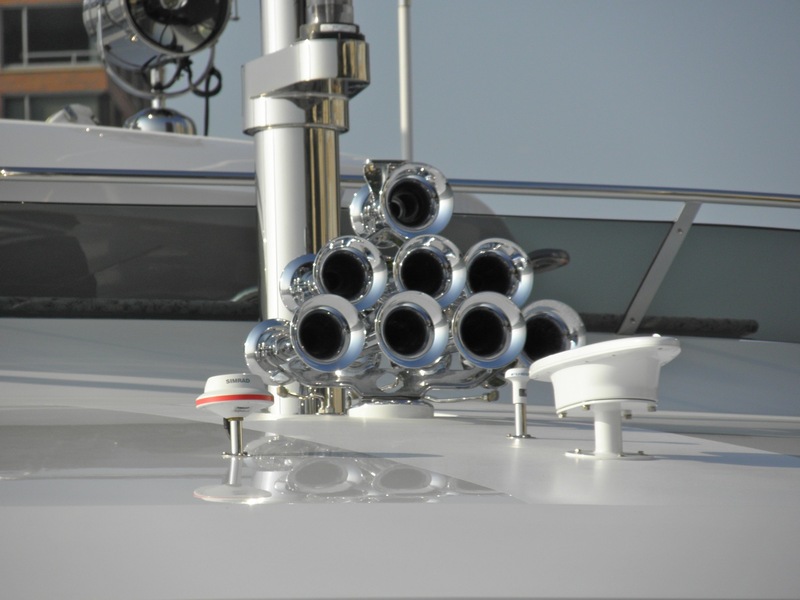 lights, signals, and navigation components. 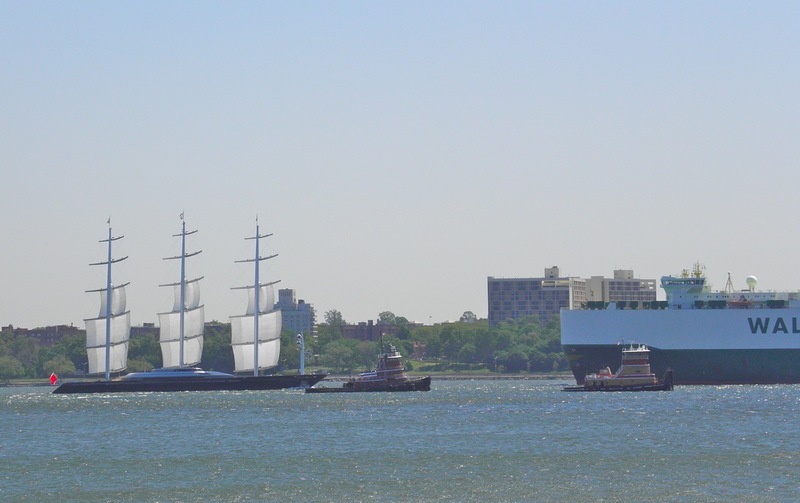 Note the crew of tug and barge on the left side of the foto who were fortunate to have a frontrow seat as Falcon screamed past; also, invisible are the mechanical mariners (“75 electric furling winches”) aloft in the rigging striking sail in this series of fotos. Royals (?) are already doused here. 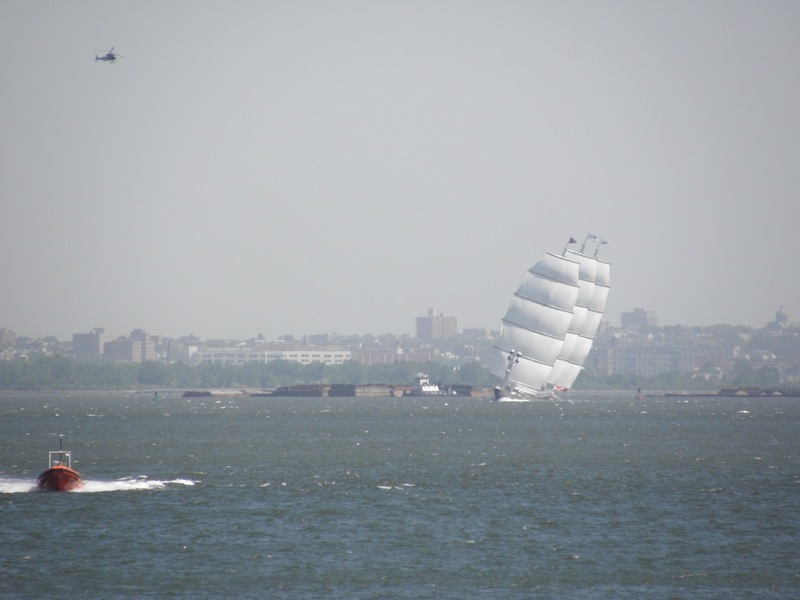 As Falcon passes Owls Head, she passes PCTC Otello as the mechanical mariners further shorten sail. 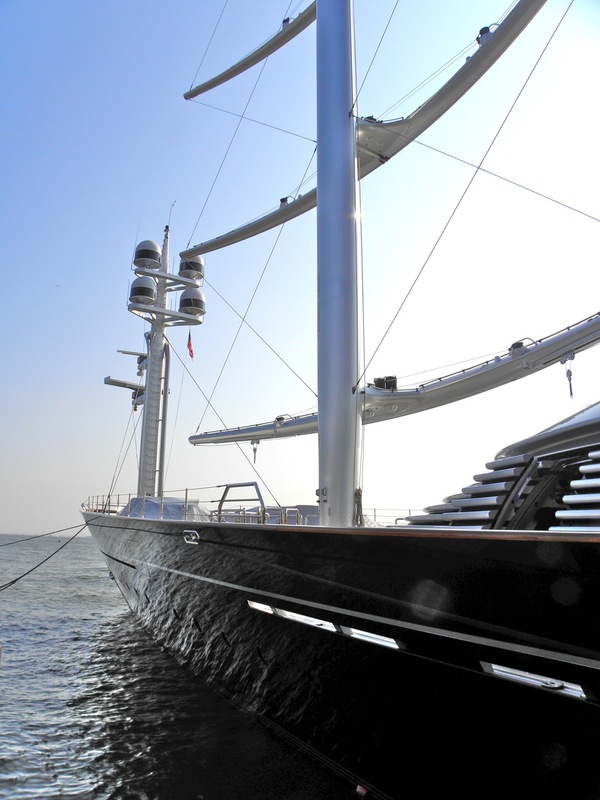 Check out this splash scene aboard Otello. 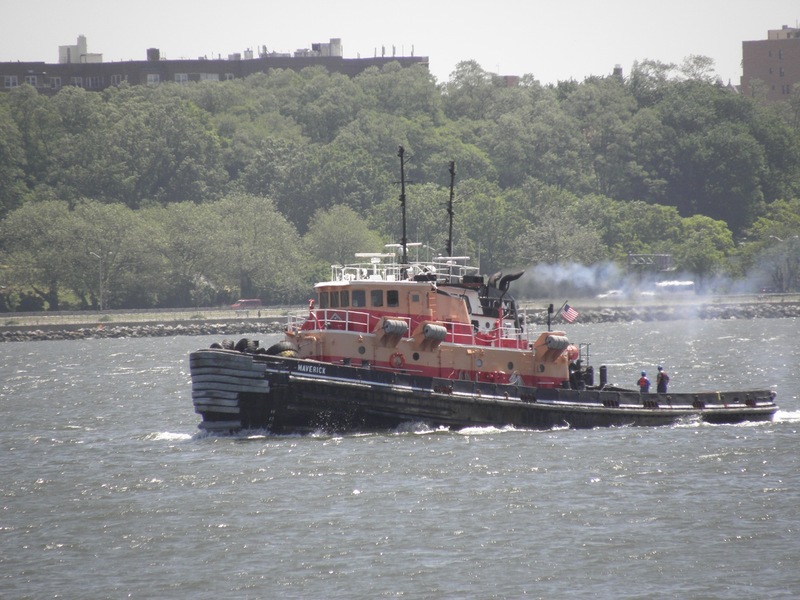 Notice also the major design difference between the two tugboats. 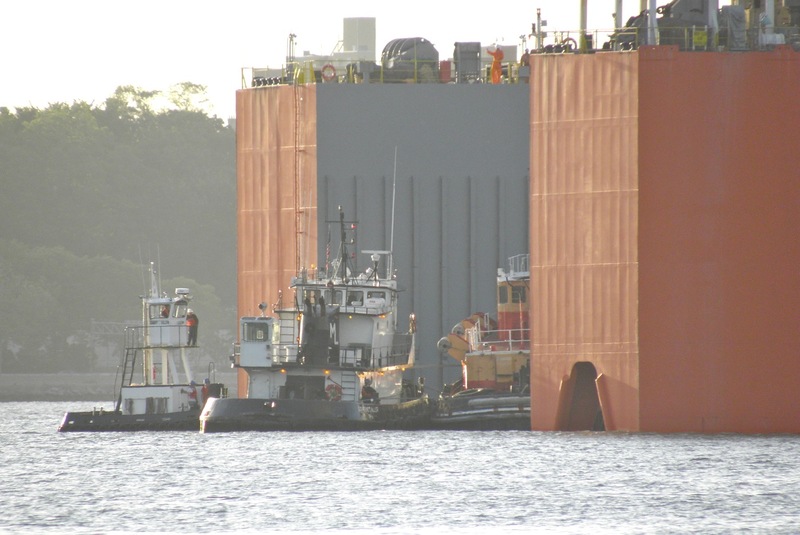 A few hours later, these fotos show the last of the “off-loading” scene at Blue Marlin, after yesterday’s unsuccesful loading attempt. 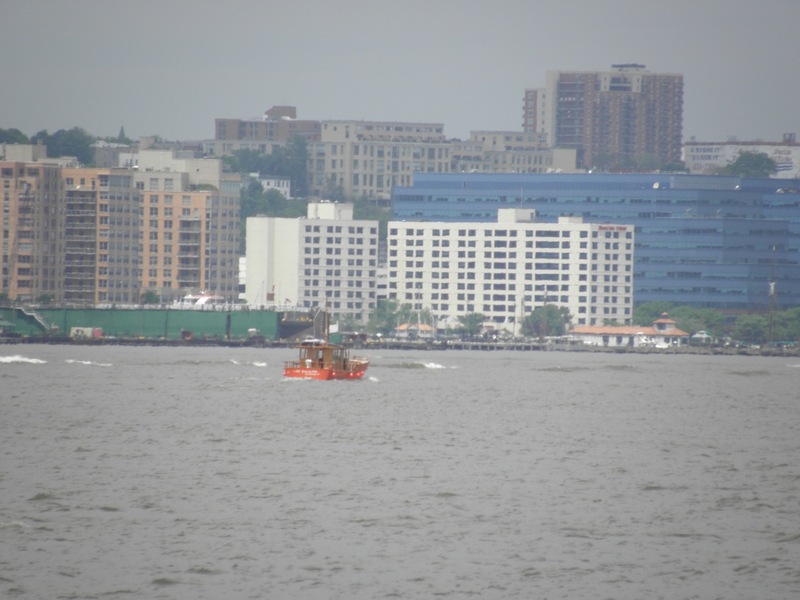 These fotos, thanks to my friend Ed Fanuzzi, look toward Owls Head, across Red Hook, and toward Manhattan. 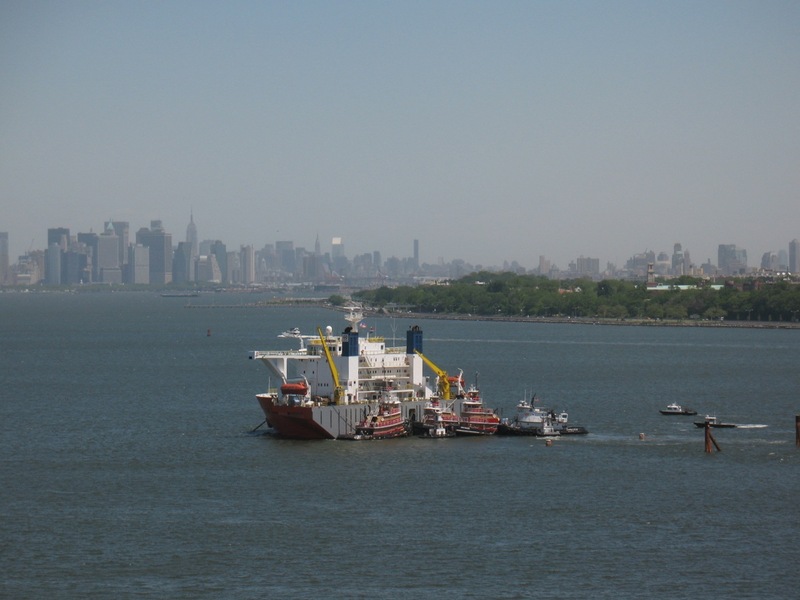 And when I offered some explanation, including references to this vessel returning the USS Cole from Yemen to the US, I got . 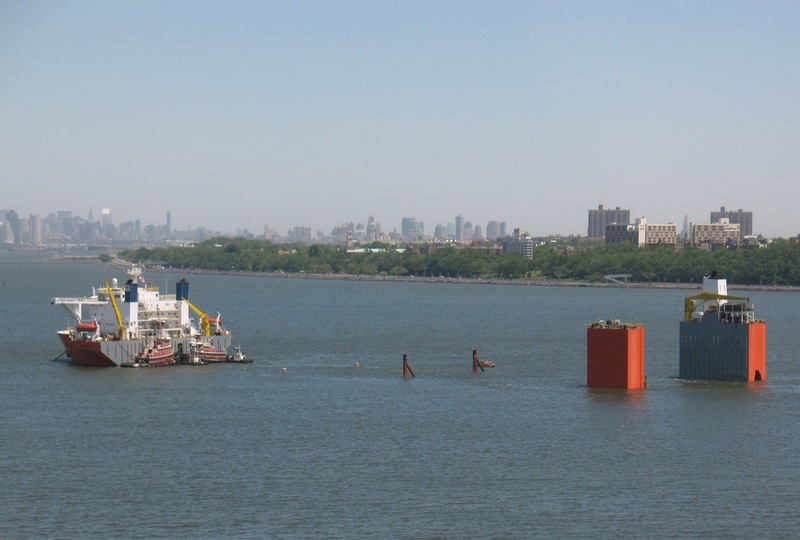 . .
All of which brings me back to my chorus: ordinary folk who live on the land masses around the sixth boro, in spite of all the mainstream paper, broadcast, and wired media, do not know very much about doings on the water. One person I spoke with yesterday while sitting taking fotos was so impressed by these goings-on that she took her kids out of school for a few hours so that they could see this; THAT is responsible parenting, taking charge of your children’s education, IMHO. Anyhow, the beat goes on. Or, how about these “wake-up” scenes from “Groundhog Day,” the movie. Thanks again, Ed, for the bottom five fotos. 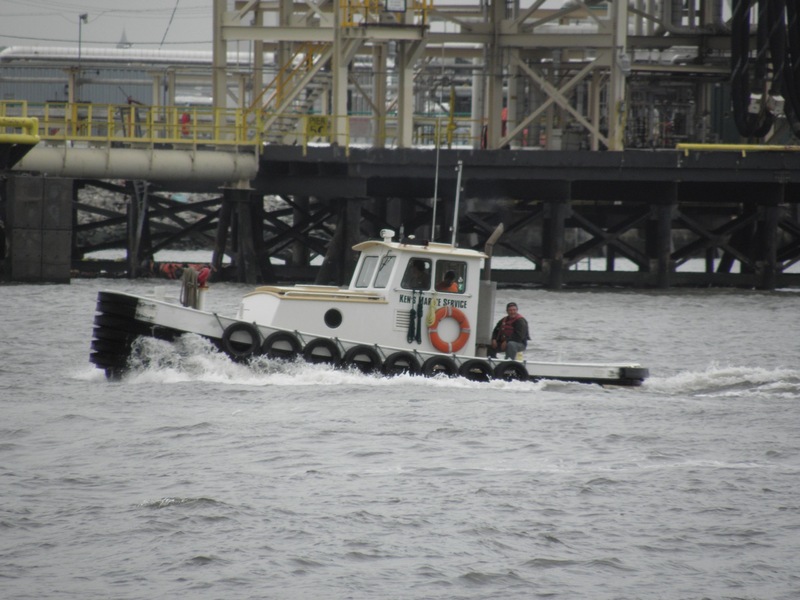 Unrelated: for scenes of Seattle harbor during the recent tugboat races and more, click here for Meryll and Tom’s blog. Given the title, what do you think happened? 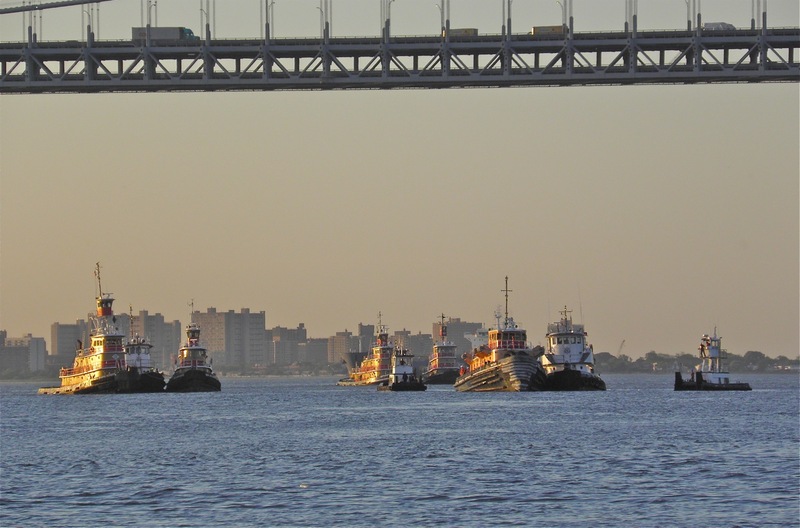 By 6 a.m., all six tugboats were assembled, looking almost like the start of a tugboat race. By 6:30, Maverick was in position. 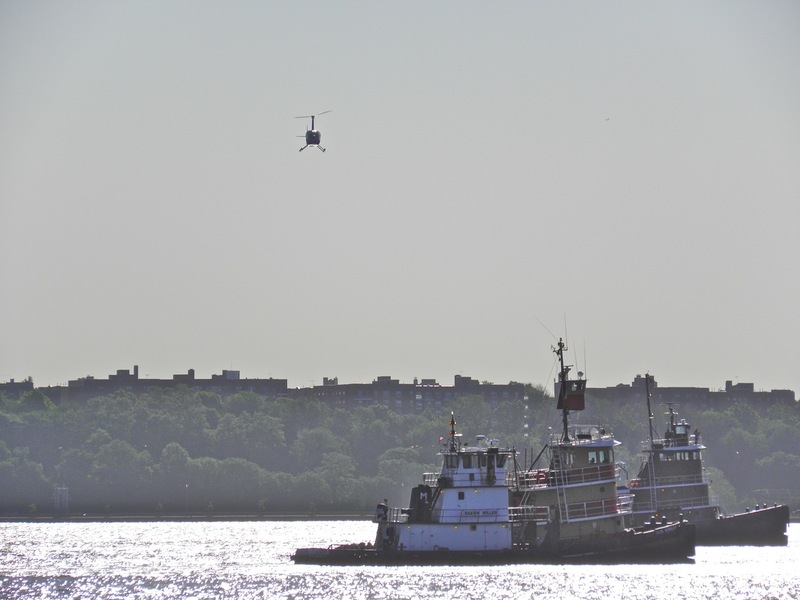 that helicopter or that McAllister boat, Girls . . . I believe. 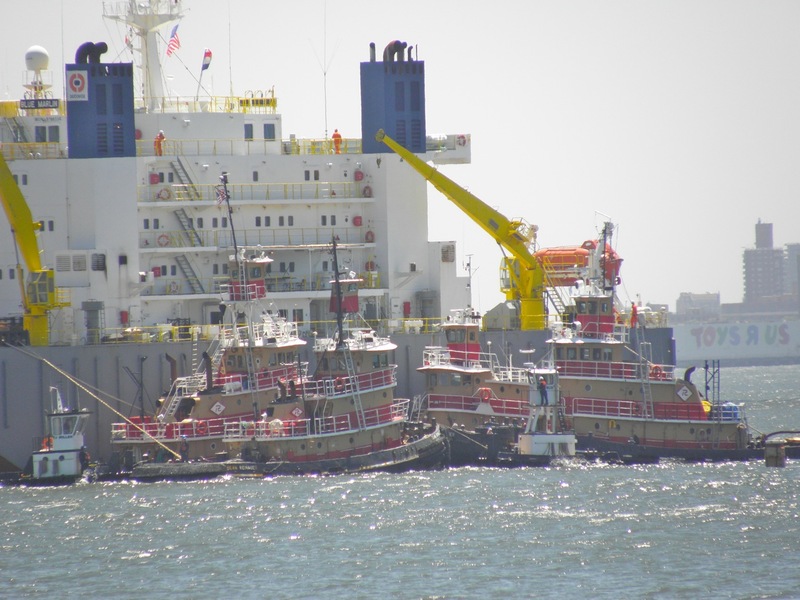 But position is even more important for the cargo, the tugboats being loaded for sea. John shifted. Indeed, this is starting to seem too similar to the movie . 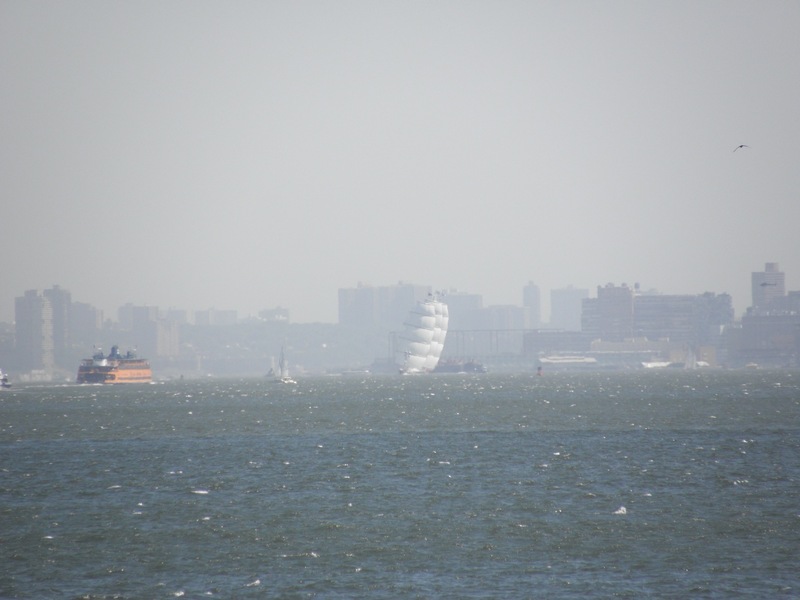 . .
see this display of Maltese Falcon swooping form Chelsea Piers on the North River, all 289′ loa heeled over as she slalomed between the vessels in the anchorage. How fast . 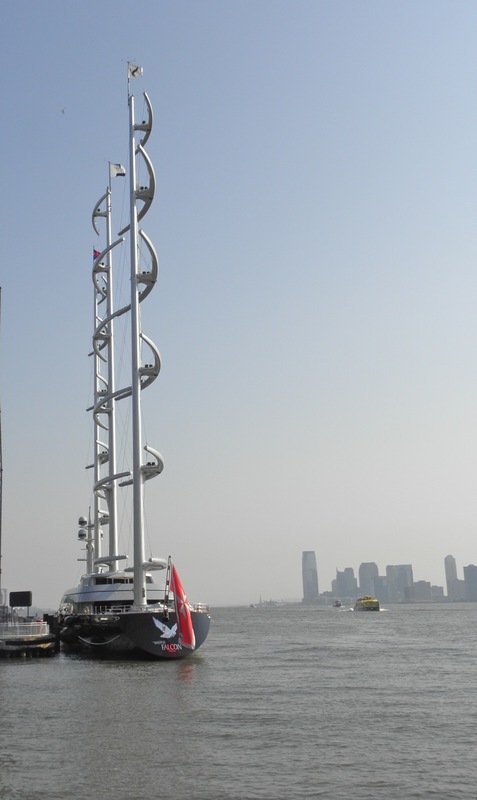 . . 15 knots? All fotos by Will Van Dorp, who . . . like Bill Murray in the film, gets another chance to figure stuff out. 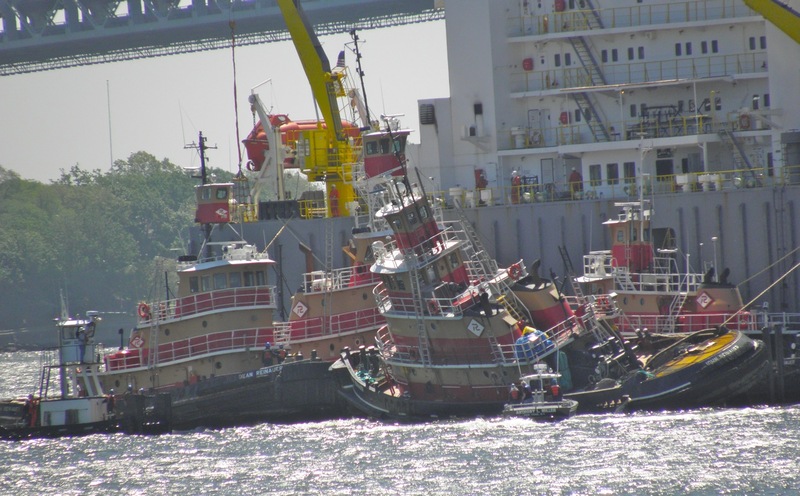 It occurs to me, though, that sailing vessels should lean, whereas the same is NOT true of tugboats. Any guesses? 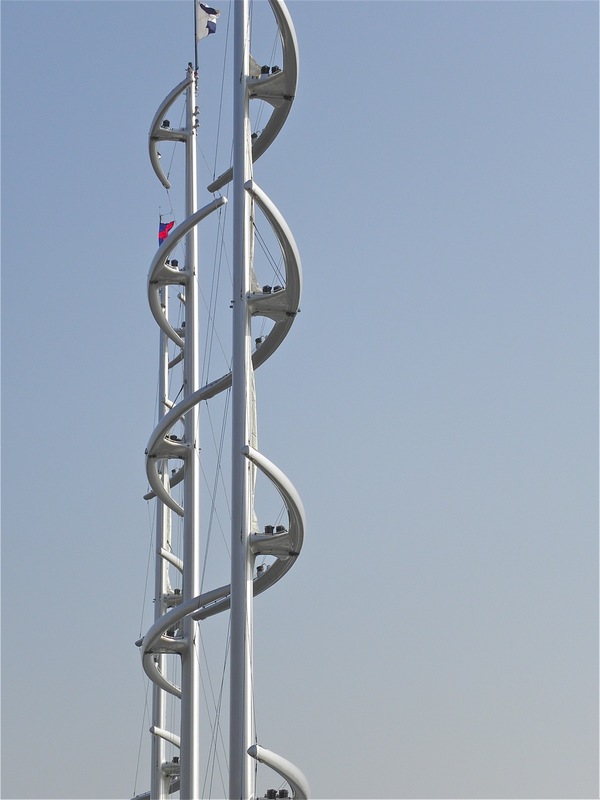 Something new at Coney Island? Here’s a slightly different angle. Different vessel but this foto’s dedicated to Paul Strubeck, who may just decide he needs to go shopping, eh, Paul? 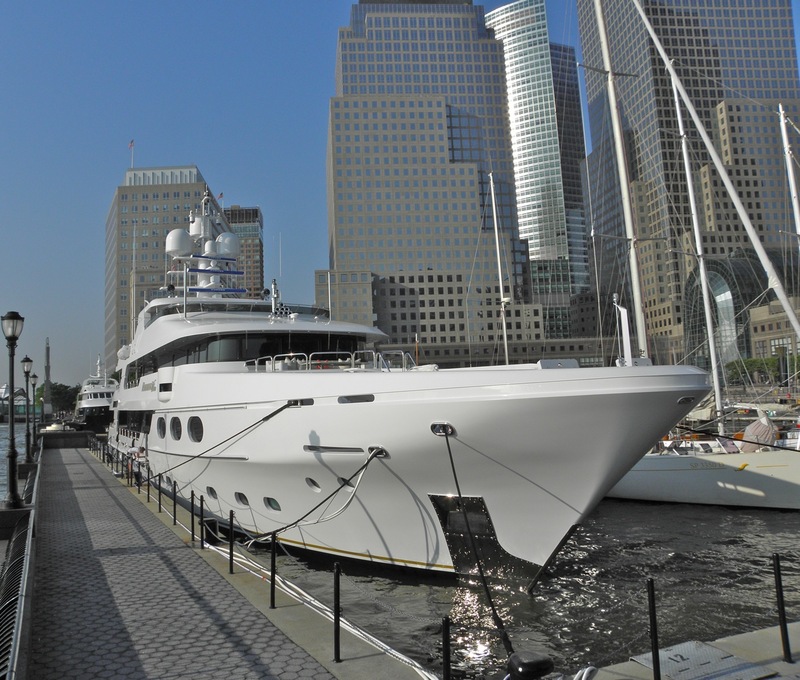 Those horns signal the approach of Remember When, yesterday docked in North Cove, Manhattan. That’s the Winter Garden just beyond the bow. Thanks to Harold Tartell, see her invisible parts here. 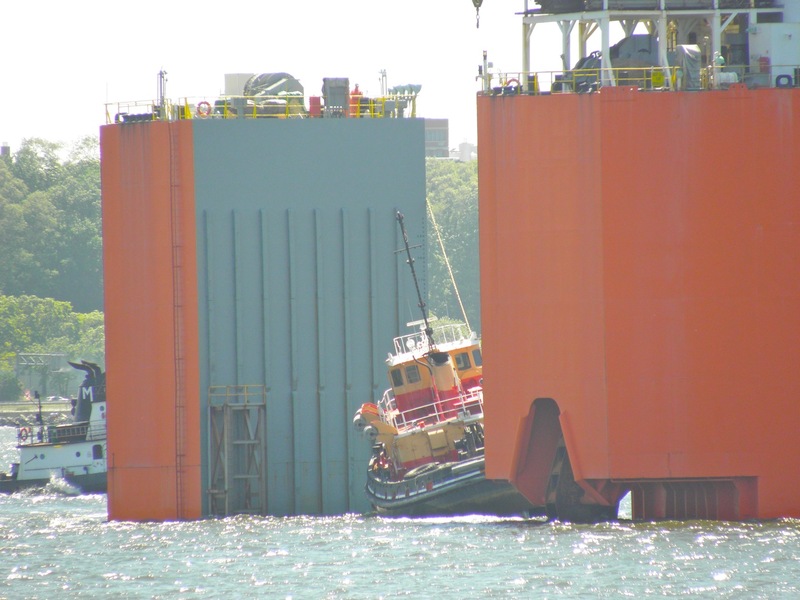 Here’s Remember When entering the harbor a few days back. 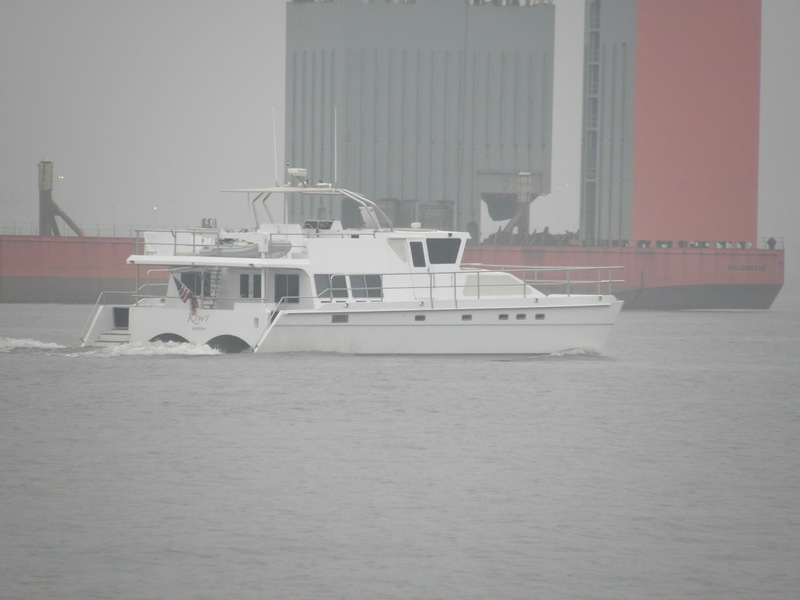 I’m intrigued about this vessel; when it entered the harbor two weeks back, I couldn’t find a name or anything anywhere. Anyone know? Enter yacht Kiwi, from Boston. 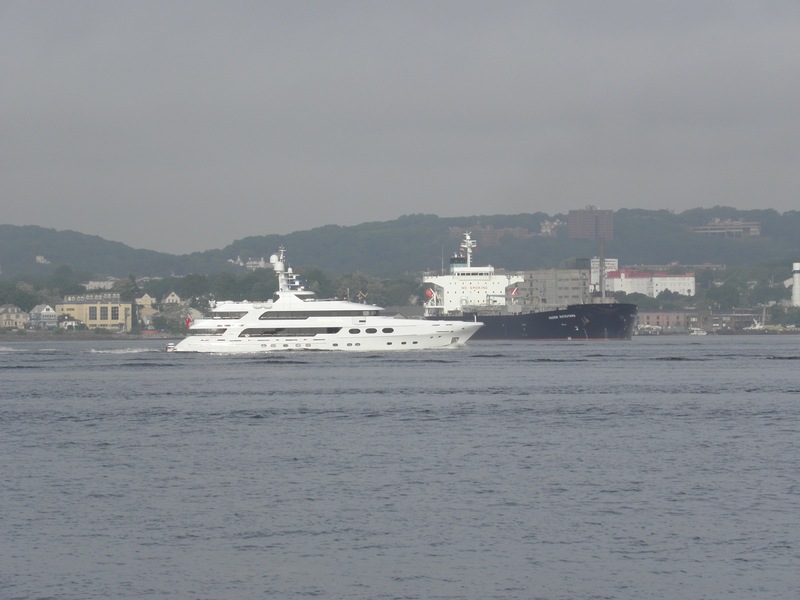 This was my first time to see this stylish boat by Ken’s Marine. 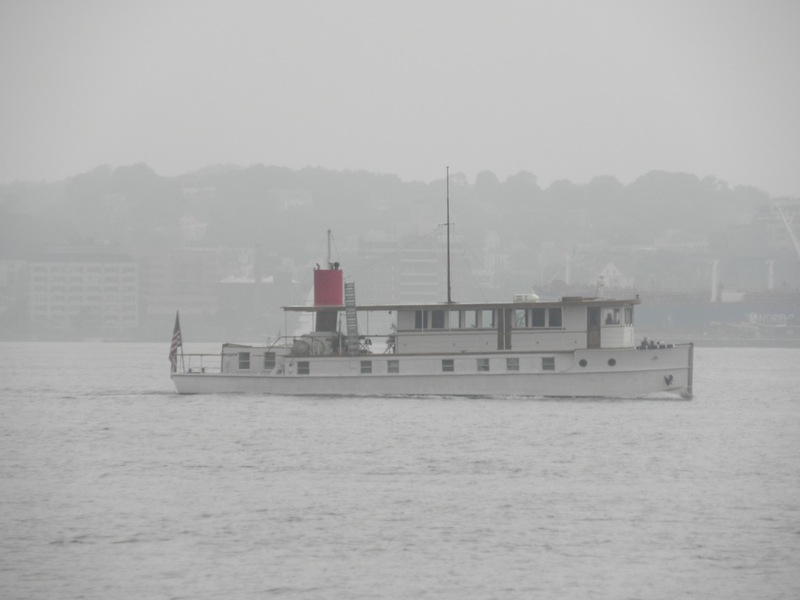 Seriously, in this post, this is the first vessel I could truly envy. Bravo, Ken. Name? And this orange vessel . . . it was too far away to identify when I spotted it and took this foto. Anyone identify? 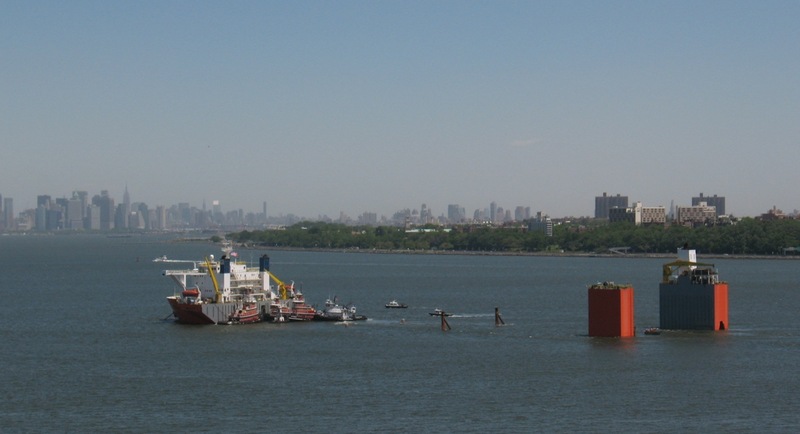 It was headed for the George Washington Bridge when I took this. So back to the two first shots . 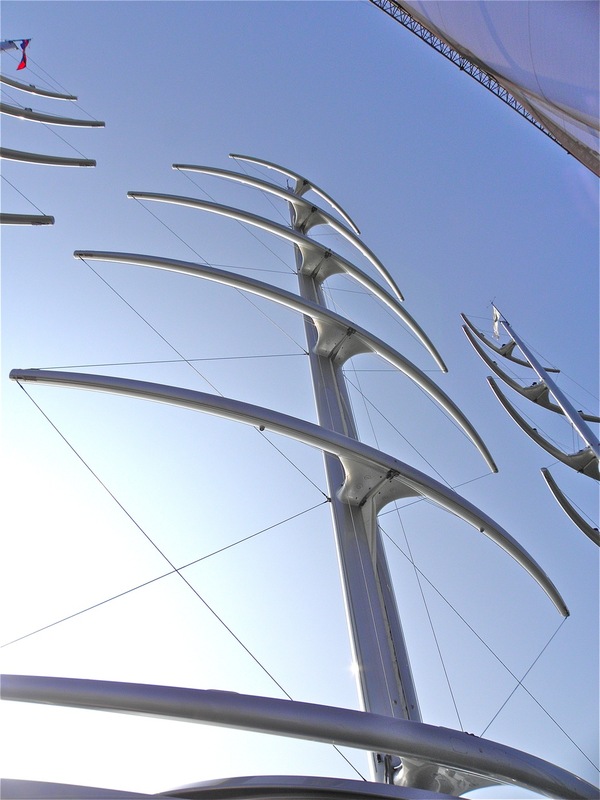 . . they showed the spars of the dynarig aboard Maltese Falcon, built in Turkey. 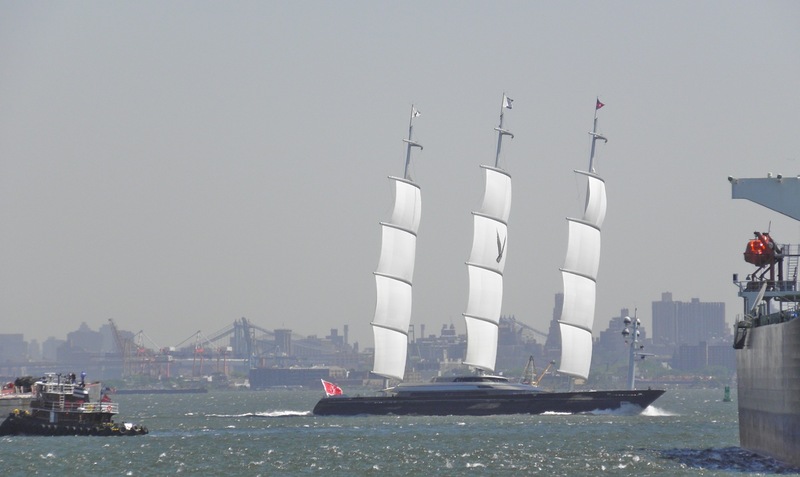 Maltese Falcon sports 15 square-rigged sails stored in and automatically deployed from the three free-standing masts. 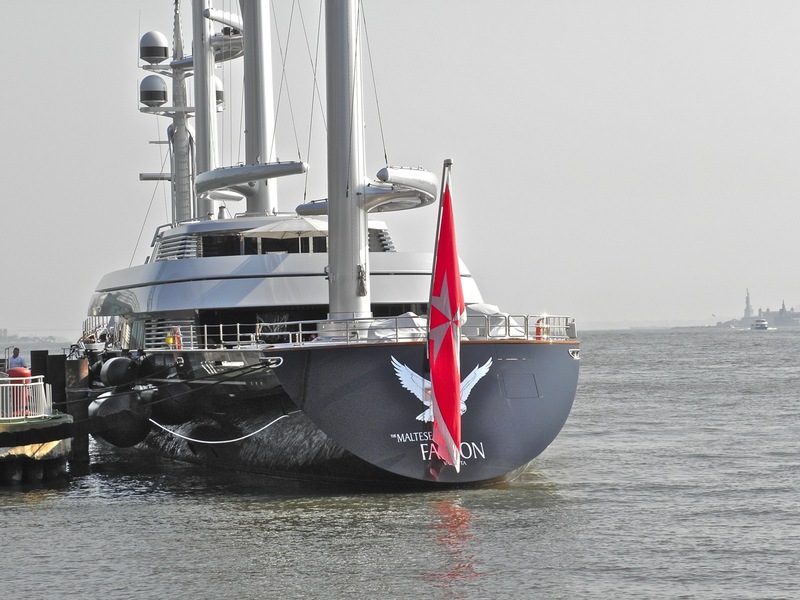 You might call Maltese Falcon today a “used yacht,” not that that would diminish the vessel: it was completed for Tom Perkins in 2006, who in turn sold it to Elena Ambrosiadou in 2009. 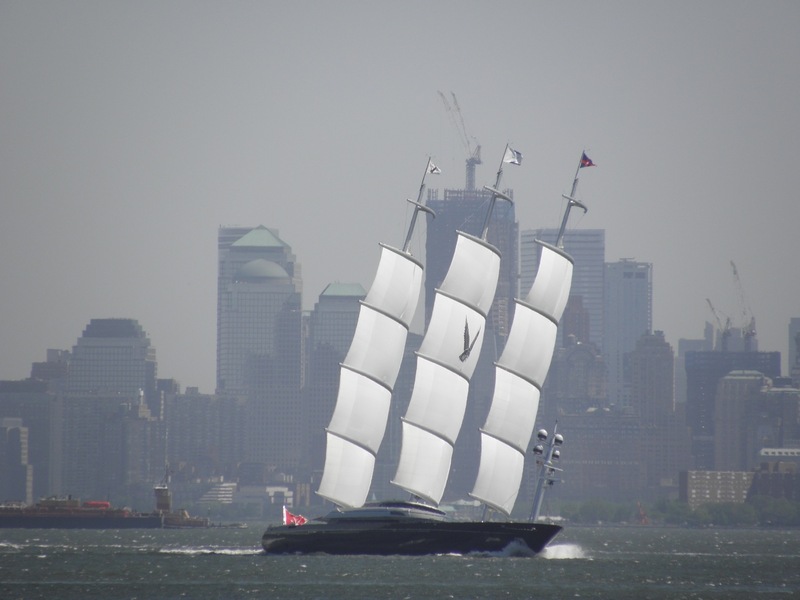 I’d love to see it under sail. 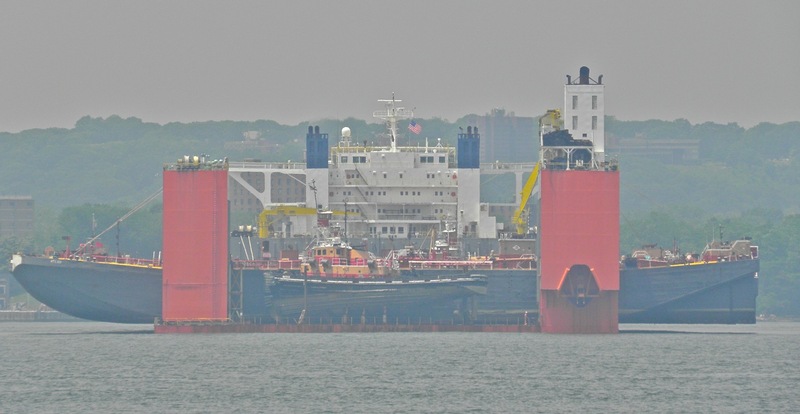 If I put details together in those links, Perkins launched the vessel in 2006 after investing about $200 million and sold it three years later for about $100 million? Depreciation? Poor math on somebody’s part? 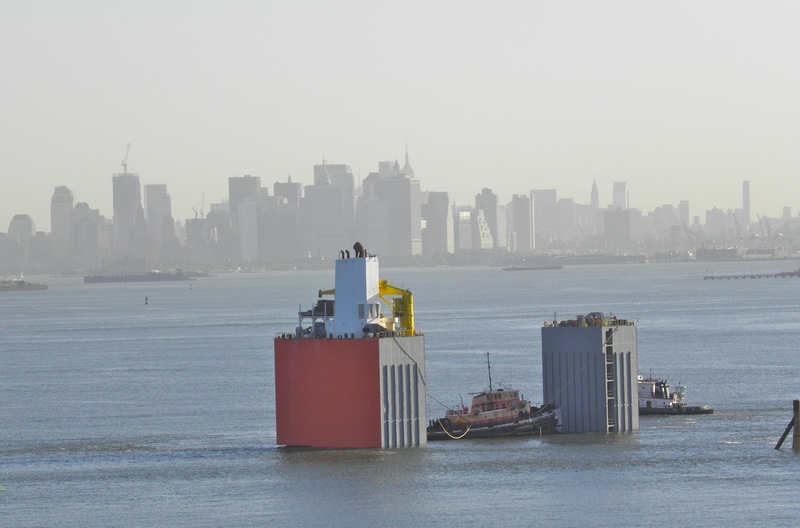 Has anyone read Mine’s Bigger. . about the building of this vessel? 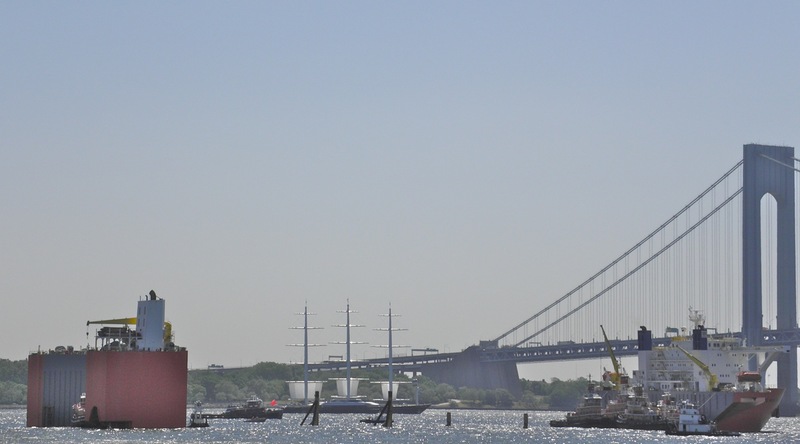 Maltese Falcon’s presence in town brings to two of the three largest sailing yachts in the world bathing in the sixth boro in May 2011. Word of the sixth boro must be getting out there. 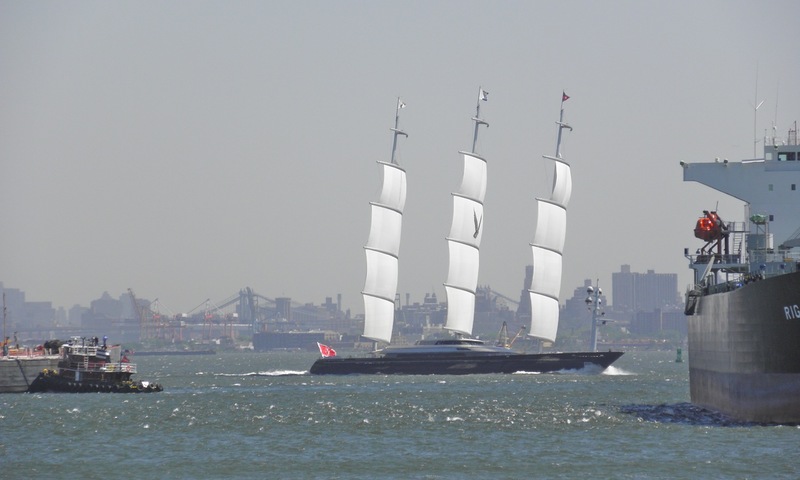 Now you can call Maltese Falcon a yacht, or a second-hand houseboat . 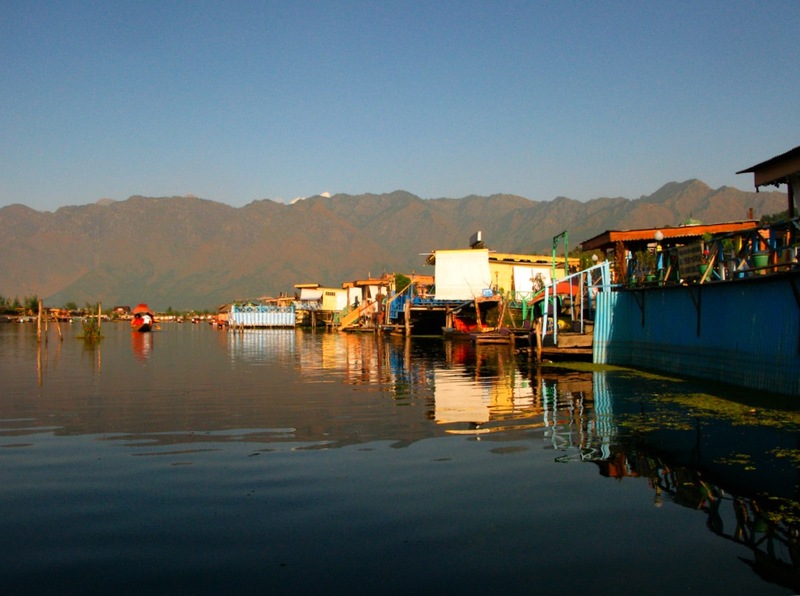 . . but it does rank right up there with the most exotic houseboats in the world, those on Dal Lake in India. Bottom foto here thanks to Saskia deRothschild; all others by Will Van Dorp. Unrelated but tied to yesterday’s book tip post, gCaptain’s John Konrad has been doing some fantastic posts recently–as most of you probably know. My favorites related to the anniversary of Deepwater Horizon tragedy and great fotos on the ice in the Arctic. New profiles in the air? Outline of a futuristic heavy-lift ship with a dynarig? 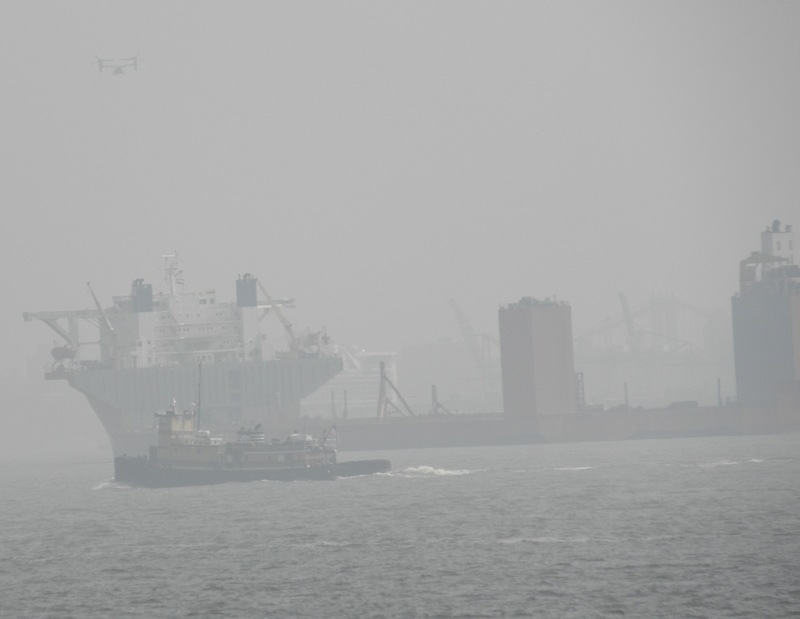 Hot seas giving off vapors of methane? Maybe I’m just losing my mind? Nah . . . I’ll cut the silliness. 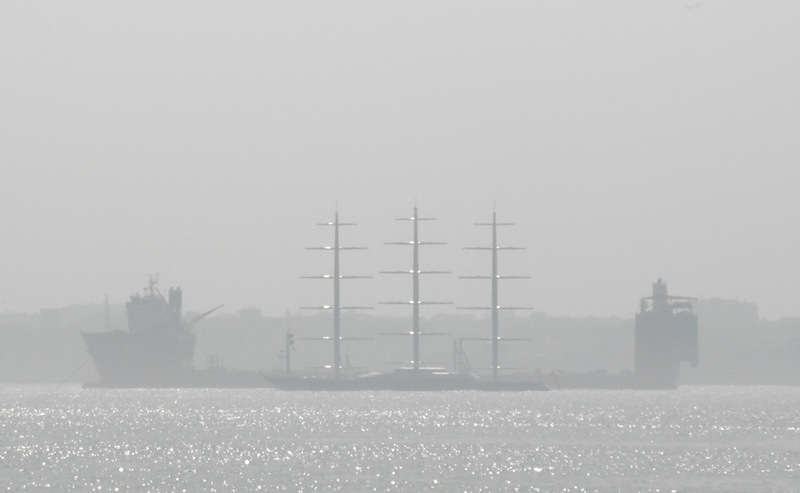 I was just lucky to catch this shot of Maltese Falcon as it passed by the west side of Blue Marlin. 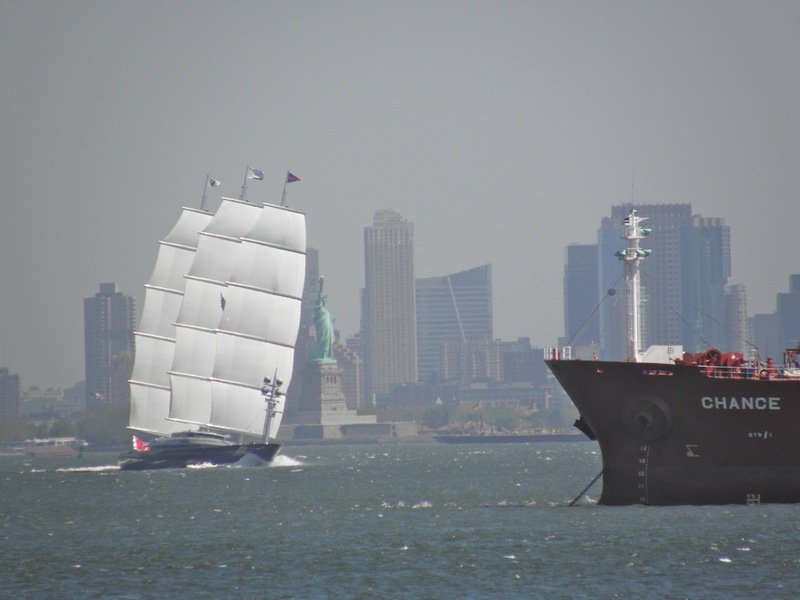 Read about Maltese Falcon here and the big ego of its first owner here. Classic mid 20th century silhouette of an Erie Canaller with telescoping house grounds the scene, although given the color scheme, that canaller is not a usual a current resident of the city . . . must be mischief . . . I mean Matton-built Mischief (1958, ex-Cissi Reinauer, Cissi, Thornton Brothers) More Mischief below. 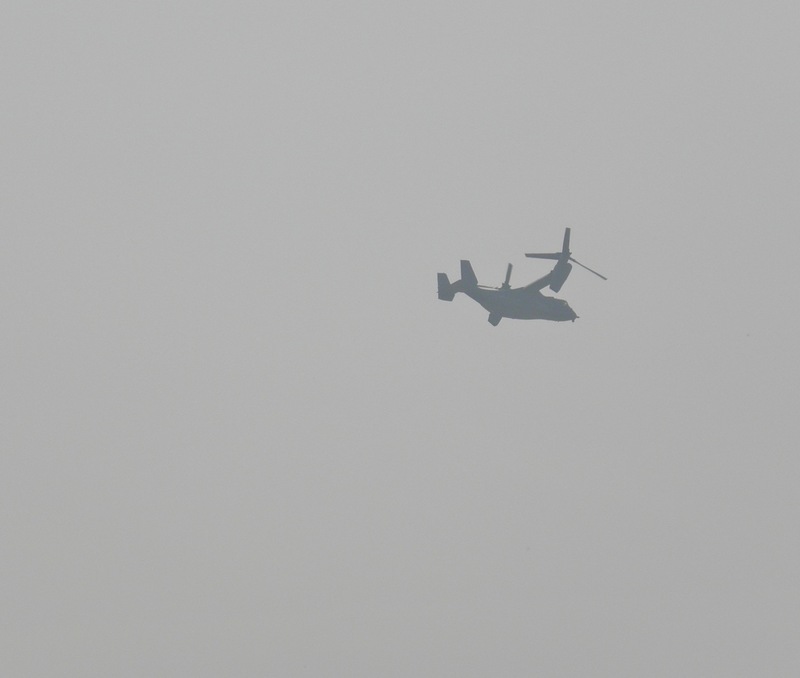 Of course, also in the haze of late May . 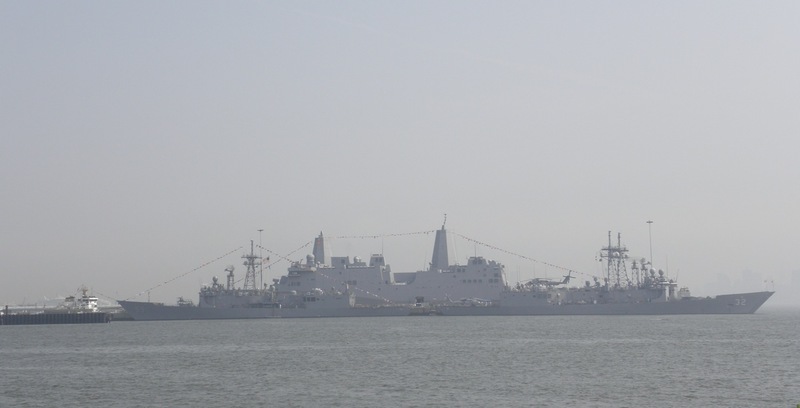 . . it’s the fleet, here shown LPD-21 . 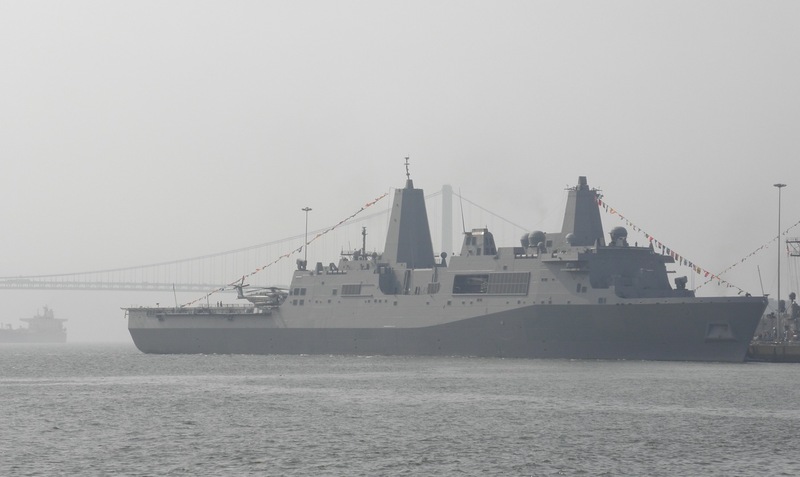 . . USS New York . 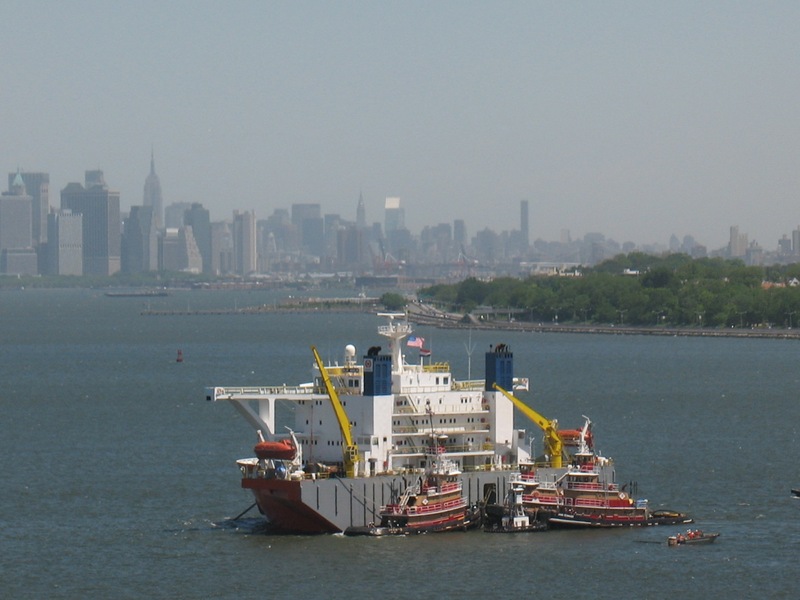 . . over at Homeport, Staten Island! Here’s one of my previous posts about USS New York. 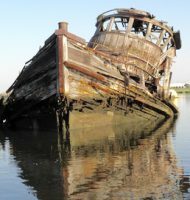 For a straight-forward post on the arrival of the fleet, see Old Salt here. Another comes from Philip of seaandskyny. I hope that tomorrow brings some progress with the loading of Blue Marlin. More Mischief . . . foto taken in Philly last June.